A man was standing beside his car and he was chatting to a woman. Just general chit-chat, I’d say, though I couldn’t hear any of it. What caught my eye was what was happening at the back door of his car, which was wide open. There was an old sheep dog there, black and white and shaggy, and he was trying to get in to the back of the car. The owner was deep in his conversation and wasn’t paying attention but I couldn’t take my eyes off what I saw. The old dog had his front paws in the car, all fine and good, but he couldn’t manage to get his back legs in. Those rear legs were scrambling and scraping and working with a kind of tired ferocity, trying to gain purchase on the lower edge of the door frame. The old dog tried and tried but just couldn’t manage it. The dog’s mouth was agape and his tongue was lolling in a configuration that people often seem to mistake as happiness but which was clearly stress. The man having the conversation looked up and saw me. I hadn’t fully realised that I had stopped in my walk past and was simply standing and staring at the dog from about 20 yards away. I hadn’t realised that I was just a heartbeat away from moving to the poor dog’s aid. The man looked at me and clearly wondered what I was staring at. Then he looked over the top of the open car door and saw his old dog there, scrambling and scraping valiantly but with an increasingly tired air about him. The owner smiled over at me as he broke off his conversation. And, with that, he moved to the dog and gently lifted his posterior so that the dog could finally get a grip on the door ledge and propel himself into the car. I smiled back at the man and walked on, out onto the path that runs diagonally across our village green. I was only a few steps on when I saw another dog. A younger dog. She was little more than a grown pup. Her owner, a young guy, was throwing a ball for her and she was chasing it. 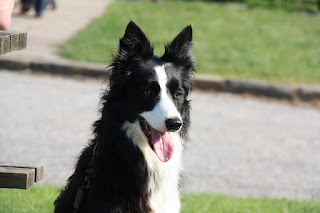 She was a sheepdog, just like the dog at the car but her black and white colours were bright and vital, where the other dog’s had been loose and dull. She was sleek and fast and powerful where the other dog had been weak and slow. She was an exact duplicate of the older dog, only twelve years younger. She powered after her ball, cutting ridiculous banked corners like some motorbike rider in a race and, although her mouth was also agape and her long tongue lolling, there was no mistaking her energy and her enthusiasm for the game. Why write this down? Why bother? It stayed with me after I had walked on, after I’d had my lunch. The old dog and the new dog had been in the closest of proximity to each other but neither had acknowledged, or even been aware of, the other’s presence. The younger was far too engaged in the thrill of the hunt to see the elder. The old dog too taken up with the mechanics of simple movement to care who else was around. There seemed to be some kind of comparison between these dogs and how I lead my own life. Blinkered to the old person I will soon enough become, if I survive that long. Indifferent to the young as I struggle to scramble up to the next ledge. Maybe there’s a good analogy to draw out of this confluence. Maybe there’s a good lesson for me to learn. But I’m too tired to work it out right now. I must be getting on with things. Maybe I’ll come back to it some other day. This is what I hate about the way I write. I’d be like you when I saw those two dogs—Gee, I must do something with that—but because the idea comes from my conscious mind I invariably can’t or if I do have a crack at it it’s never my best work. Any bloke-of-a-certain-age walking down the street and witnessing those two dogs would most likely make the same connection you made. What I like when I’m reading is to be shown something I should’ve seen and I want to kick myself for not seeing because it’s so obvious. Many’s the time I hear a song and think to myself, Why didn’t I think of that? You need to leave those two dogs alone and see where they pop up next. IMHO. The creative process—inspiration for want of a better word—has always perplexed me. I defies reason. You see probably what’ll happen now since I can’t get those dogs out of my head is I’ll be watching TV later this evening and see a third dog and the next thing I know I’ll have grabbed my tablet and half a dozen lines which will probably never end up in a finished poem will have appeared and every few weeks I’ll have a look at them and wish I could do something with them and I’ll mention this to you in passing in some future comment whereupon you’ll remember the dogs, now from a safe distance, and go away and write a play about an old man trying to lift a box into the back of his car while his grandson plays Frisbee in the park across the road. And then you’ll read it over and think, Nah, a bit too Mitch Albom and stick it in a drawer and forget about it.